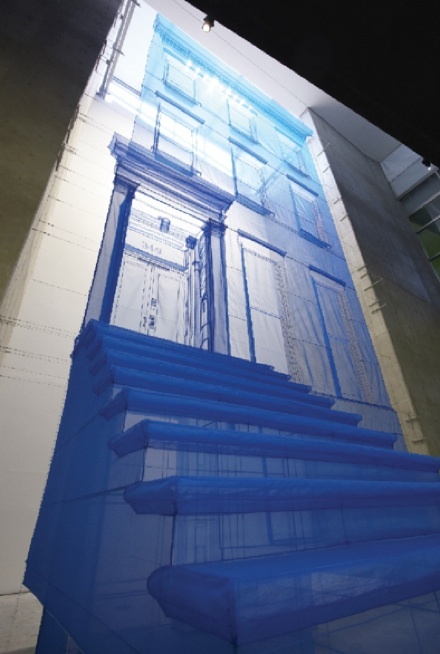 Do-Ho Suh, Reflection (2005–2011). Images via Leeum Samsung Museum of Art. 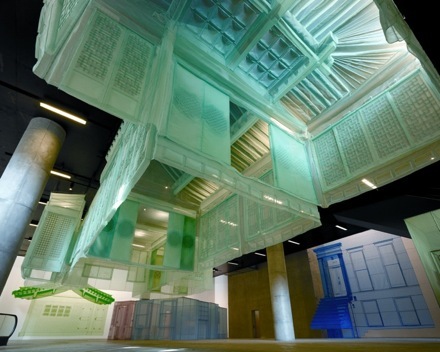 Korean-born multi-media artist Do-Ho Suh exhibits Home Within Home at the Leeum Samsung Museum of Art in Seoul, South Korea through June 3. The show assembles sculptural works produced over the last seven year years, which recreate interior and exterior spaces in fragile unions between skeletal metal armatures and diaphonous silk and polyester fabrics. Through his magnificent and acutely embellished domestic shells, Suh delivers fragile and impermanent representations that toy with our understanding of the home as physically and ideologically sacred and safe. 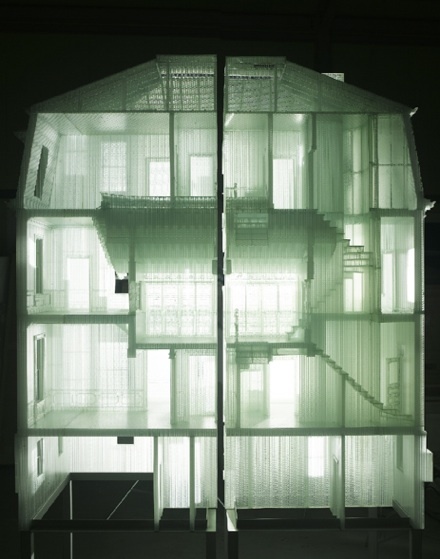 Do-Ho Suh, Seoul Home/Seoul Home (2012). 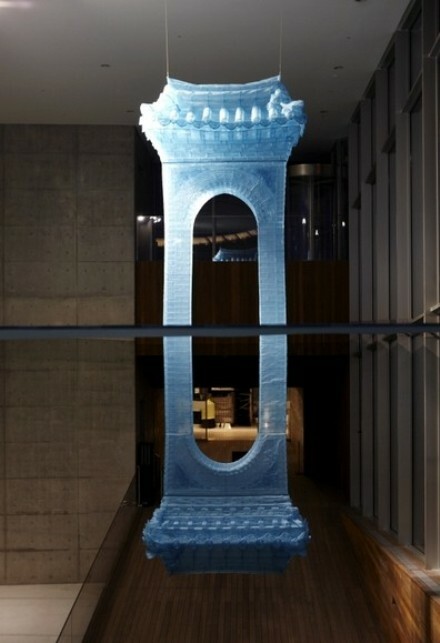 One of the most recent and elaborate of the pieces included in the exhibition is Seoul Home/Seoul Home of 2012. 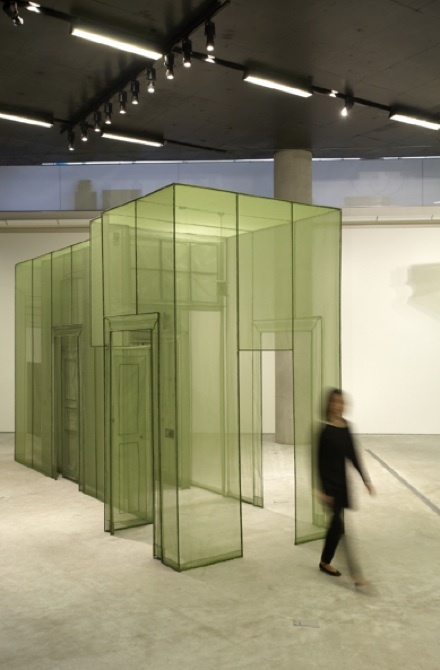 The work is suspended from the ceiling of the gallery, allowing the viewer to glance into the various rooms and compartments created in light seafoam green silk. Suh’s commitment to detail and craft can be seen in the ornate wall paneling, where he wields the silk into a protruding maze of geometrics. 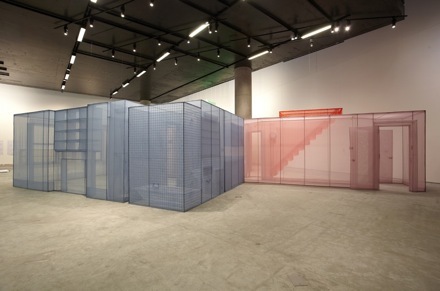 While this work is kept physically inaccessible to the viewer, other pieces throughout the show offer open access to Suh’s domestic constructions. 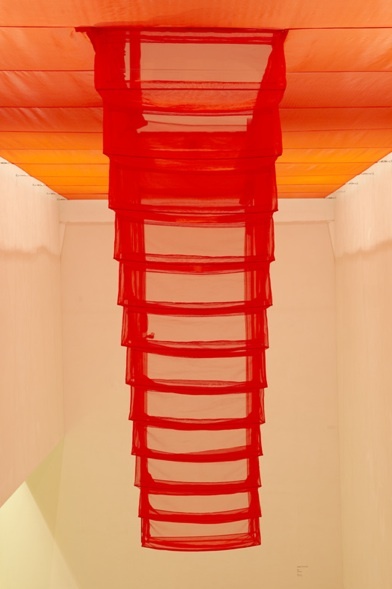 Do-Ho Suh, 348 West 22nd Street, New York, NY 10011, USA–Apt. A, Corridor and Staircase (2012). Suh’s works 348 West 22nd Street, New York, NY 10011, USA–Apt. A, Corridor and Staircase (2012) and Wielandstr. 18, 12159 Berlin, Germany–3 Corridors (2011) are displayed on the floor of the gallery, and are open to move through by visitors. Both are modeled after the artist’s own residences in New York and Berlin. They offer an atypical view into the landmarks of his life, as seen through his own artistic revisioning. These delicate passageways compromise the sense of comfort and protection associated with a house, but as art objects provide a heightened awareness of the spaces’ importance. With these works, Suh creates all-encompassing environments, and includes fixtures such as cabinetry and bathtubs for the most accurate, if non-functional copy of his former domestic space. 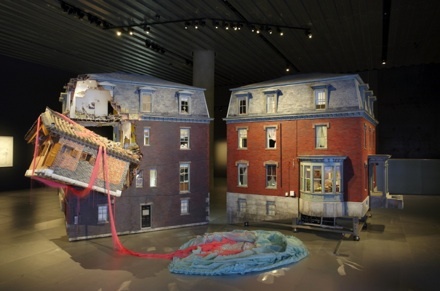 Shown in the gallery’s Black Box space are Fallen Star 1/5 Scale (2008–11) and Home Within Home 1/11 Scale (2009). Other works in the show explore the notion of home and domesticity through a physical interaction with the work, while these scaled models explore the collision and absorption of different types of homes, and perhaps cultures, respectively. In Fallen Star, a hanok-style house crashes into a western pre-war apartment building. By contrast, we find the same structure peacefully immersed in the surrounding apartment building in Home Within Home 1/11 Scale. Home Within Home invites examination of several paradoxes within the show’s aesthetics and themes. Disruption, union, and the nuance between house and home are found where typically massive and fortified structures emerge from fine fabrics and hollow infrastructure. 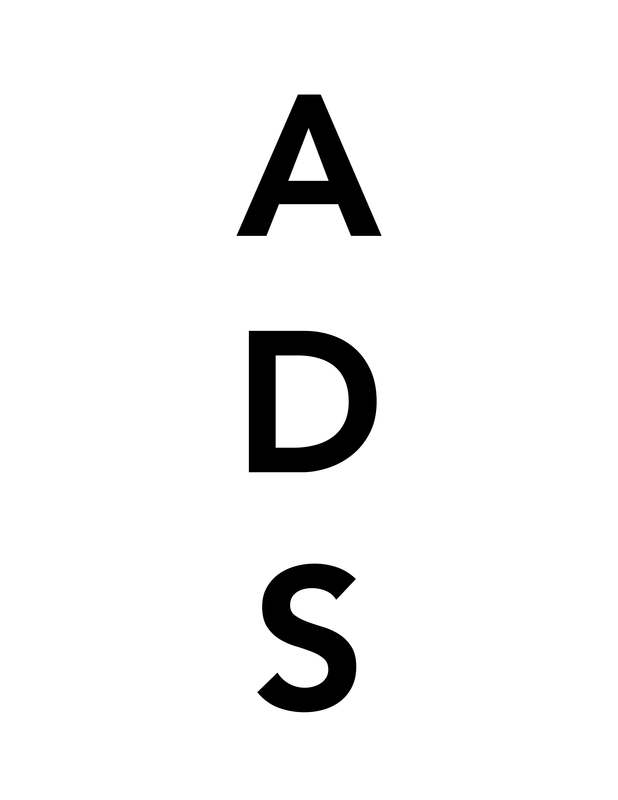 This entry was posted on Thursday, May 17th, 2012 at 12:02 am	and is filed under Art News, Go See. You can follow any responses to this entry through the RSS 2.0 feed. You can leave a response, or trackback from your own site.